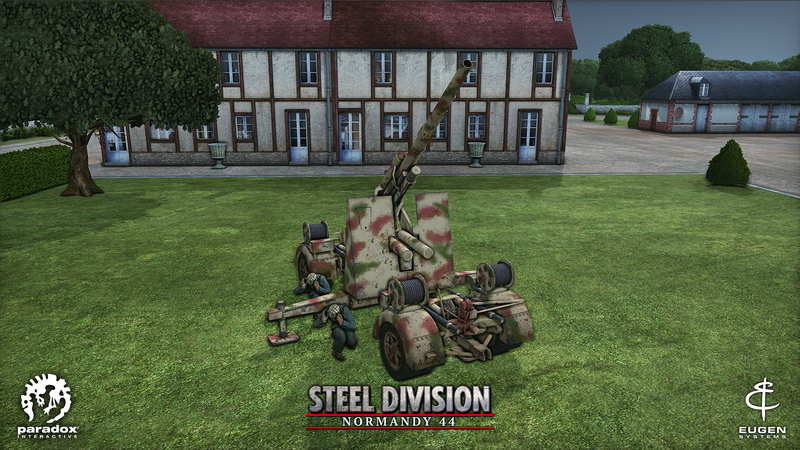 During the Pre-Order Beta, we read a lot of comments about Anti-Aircraft (AA) units and their effectiveness, their balance, and their purpose in Steel Division: Normandy 44 generally speaking. 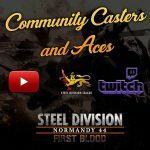 In this blog article, we would like to talk about how we thought, created and balanced the Anti-Air class by merging History and Gameplay, but also provide you a strategic understanding of how to use it. From the start, we wanted to make planes and AA’s behavior as realistic as possible, as for every unit in the game. During World War 2, AAA (anti-aircraft artillery) was really unreliable and a huge amount of attempts was necessary to get a lucky shot and take down a plane. We tried to reproduce this state of affairs in the game, and that’s why you’ll never see an anti-air unit kill in one shot a plane unless a miracle happens. On the other hand, in 1944, the gap between the two sides couldn’t be ignored, as the Allies claimed most of the air superiority. However, even if Axis battlegroups may lack dogfighters, they can compensate with some very powerful AA units like the 88mm guns. According to your overall battle plan, you must choose your units carefully because their impact will differ regarding many parameters. The most important thing regarding AA is to move away from the notion of accuracy, to focus on the rate of fire and the range. An anti-air unit can either fire salvos of shells very quickly but not very far, or shoot further but slower. The notion of accuracy is irrelevant in that case because planes are always moving and twirling, what matters is the probability of one of your many shells hitting the enemy. Long range guns (88mm): They can protect a large area with powerful shots that can suppress a lone plane very quickly. But their slow rate of fire makes them weak against multiple planes sent at once. A big caliber gives a long range but it also implies a slow rate of fire; it’s either one or the other. 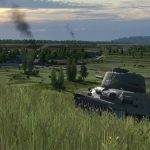 The dreaded German AA Flak 36 88mm answers by itself to criticisms as he is one of the most efficient AA guns in the game. Medium range guns (37/40mm): They have an average firing rate and can fire endless salvos that won’t stop until the gun runs out of ammo. They, therefore, act more as a shield but can start dealing some proper damages. Short range guns (20mm or less): These cannons can only cover a small area but fire so quickly that they are very lethal against low aircrafts. They, therefore, are perfect for an ambush. 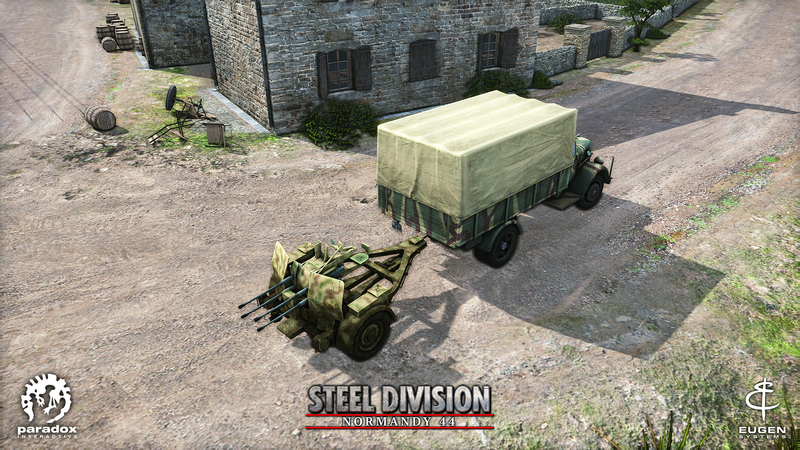 The flakvierling with its transport. The anti-air units are related to air combat in general. You must prevent the opponent from dominating the sky, and each battlegroup requires anti-aircraft units. Winning aerial battles always comes with a price. Their first purpose is to defend a zone from enemy aircraft. 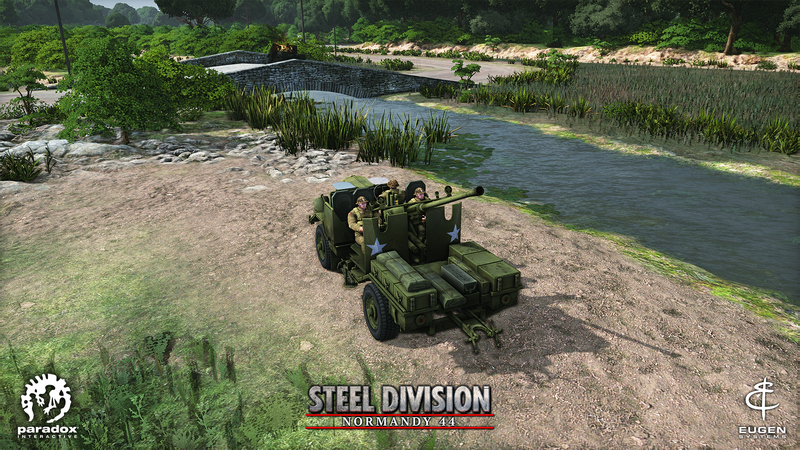 Historically, AA guns were meant to defend a bridge, a factory or a city. Around Berlin, the Germans even built some towers, called Flakturn, with AA units on it. Our first advice is to secure your Anti-Air far behind the line most of the time, or behind cover (in a forest or in the bocage) if you want to set an ambush closer to the front. In that case, don’t forget to check the Stealth value of your unit! Beware, heavy cover obstructs its line of sight, so you will have to find a compromise. 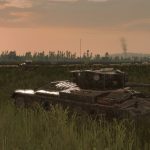 Furthermore, you may have to choose if you want to cover the whole battlefield with multiple AA units spread over the frontline, or to create some “dead zones” with several units that prevent planes from shooting or even passing through dedicated areas. Every strategy has its advantages and disadvantages. With the first one, you can’t effectively protect the entire frontline but you can repel one individual from time to time. On the other hand, the dead zones will perfectly protect a small location while leaving the rest of your troops exposed. The second purpose of AA units is to fight against ground troops. In WW2, the AA guns were also pieces of artillery and were often used that way, rather than left without orders. Also, keep in mind that most AA units turn out to be excellent fire support vehicles, and can even double as light (37mm & Bofors) or heavy (FlaK 88mm) AT guns. 88mm can be used as anti-tank guns. 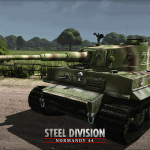 37/40mm can stun vehicles, having the equivalent power of a light tank. 20mm guns are very effective against infantry. In fact, to fully describe how to play with the Anti-Air class, we must talk about their antagonists. If you want to kill enemy planes, you must rely on your own fighters, not only on your AA units. The faster ones follow the “boom and zoom” strategy: they fly high, charge at their targets and quickly fall back. The slower but more nimble planes are called “turnfighters”: their try to outturn the opponent until they end up behind him. Globally, a pure fighter will have the upper hand on a fighter-bomber, but the outcome isn’t certain at all as many other strategies enter the equation. The most important rule of dogfighting is to engage the enemy planes from behind. It is much more efficient. Your planes’ tactics will then always arise from this principle. The most effective combat formation is to send two fighters spaced out enough to catch the enemy in a pincer movement. The first one can be used as bait, while its wingman will end up right behind the enemy and shoot it down rapidly. Sometimes, you have to be in a wait-and-see position, i.e. avoid brute force and fight enemy planes inside your airspace. A smart move would be, for example, to lure them in your dead zones to have the support of your AA units. Once you managed to initiate the fight in your AAA, you will need to shoot your enemy before he tries to drag you into its own dead zones. Finally, two reactions are possible whenever you spot an enemy bomber coming your way. You can send your fighters straight ahead to prevent the bomber from dropping its payload but by doing so you will put yourself in danger as you will have to fly in the enemy airspace. The other solution you have is to wait for the bomber to drop its bombs, and then engage it with your planes when it falls back, as soon as you have the chance to get behind it. Against a large concentration of air forces (mostly in 10v10), the key word is reactivity. When the alarm bell rings, you must know which commander(s) will send their planes. You must spot enemy aircraft soon enough to have the time to adjust. Always keeping one plane patrolling in the air can be a good solution, as they can see enemy planes coming from miles away. The most important thing to remember about AA is that it is characterized by its rate of fire and its range, not its accuracy. You can shoot fast or far, not both. Before acting, you must analyze the situation: is your opponent aggressive or does he avoid trespassing the front line, maintaining the status quo? Does he lack planes and/or AA? Does he have mostly aircraft using the “boom and zoom” strategy or does he use dogfighters? 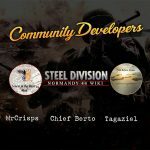 Where are its units on the battlefield, dispatched or concentrated in some dead zones? We hope that you’ll better understand Anti-Air combat now, and maybe come out with new infallible strategies! …I observed a phenomenon when playing with fighters, that they often spawn on the wrong spawnpoint, mostly in the middle one, so they are way too late… is that a known issue or do I do something g wrong? As I understand it, only a certain max number of planes can spawn from one air spawn point in a given amount of time I presume to prevent blobing. 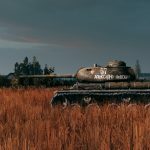 IE if you can’t spawn its because your allies have already mass spawned from that point. That’s my understanding anyway. Indeed. Some figures (Comhart T8.3, Centre des hautes études de l’armement 2007) coming from american statistics. Par contre je seconde le sieur Spawnfarkal, l’incertitude sur “mais où mon avion va-t-il bien pouvoir spawner” est plutôt gênante ! that may be the case, but how large were the AA batteries they were facing? The RAF used to buzz up and down the coast of France for example, there’d be a lot of defences there. The 8th on the other hand were flying into Germany! If you have any interest in fighter strafing tactics, it’s a great read. Short&long answer is that the germans considered 200-300m the prime territory for shooting down fighters.Mid 44, some of these airfields had as many as 120 light flak guns over a 3 mile radius, so it could get pretty dense. Good intelligence is what they emphasized– but it’s a report, so he would emphasize that. The action reports are interesting, but there are instances where they execute a well-planned attack into a field with 20 guns and completely cleans it out with 1 loss. There are also reports of an unplanned strafing losing 4 out of 5 fighters to hidden flak batteries. 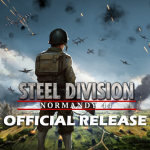 Steel Division: Normandy 44 is out!